The biggest tragedies that occurred this weekend included sewing over my own finger ,(that hurt a lot and the F word did make an appearance briefly by popular demand) sewing my glove to my quilt twice (I'm probably lucky that my hands are small and my gloves are medium or I might have run over my finger with the needle more than once) and breaking a needle at which point I also used two rather rude words then that started with M and F. But even those blips couldn't sway me from my mission: to crack FM quilting, regardless of any obstacles the universe threw in my path. I sat down at my machine, with no procrastinating, and no drinking (I really was kidding about drunk sewing), although I did stop at lunchtime today to inhale half a block of Haigh's Orange chocolate and I just kept telling myself over and over "You can do it!" The power of positive thinking is amazing. And while the end result isn't perfect - its perfect enough for me and for a first attempt. I can only get better from here and it did wonders for my self confidence. I'm actually thrilled, because I finished the whole quilt. I'm in the process of sewing the binding down to the back of the quilt and I'll show you the whole shebang when that's done but I couldn't wait to show you some snippets. One of the things that I think really helped was having a Bernina machine with BSR. I changed over from an old Janome machine to the Bernina last November and deliberately bought a machine with BSR . I'm fairly certain that was a massive help too. I just set it to foot free sewing so I only had to worry about what my hands were doing ( and still managed to run over my finger !) I think I broke the "I cant FM quilt" hoodoo well and truly and I'll definitely try something else now that I know what the machine ( and I) are capable of. You can see Terri's weekend effort at her blog here. I'm so grateful to Terri for her support and for being my FM quilting buddy this weekend, and to all of you for your encouragement, tips and comments. I think you were all sending positive vibes out into the universe and that's what pushed me over the line. I'll be back to announce the winner of my giveaway tonight Australian Central Standard Time. Good Luck to everyone! Oh My Goodness! I was wrong, you aren't scared awy from FM. Good job! Now you should be celebrating with that VODKA! Well done! I hope you cracked a celebratory bottle to reward yourself. FMQ is one of those things that get easier and better with practice. If I can do it, anyone can! Is it just a coincidence that FM and M F have the same initials? Your quilting looks fantastic. I still can't believe that it's the first time you have attempted FM quilting, and I know for sure it's definitely not the first time you have said M F.
I hope your finger is ok! I've not sewn over my finger before but it must hurt like the devil. Swear words are to be expected. You did a great job on your free motion quilting! I need to give it a go again too. And you stippled! In my books stippling is the hardest! I just CAN"T do it. Looks great - good meandering! Your poor finger! I've luckily never actually done that YET but won't rule it out. Congrats on conquering your quilt with FM! It looks great so far. Really grand! So many congratulations! It looks wonderful. 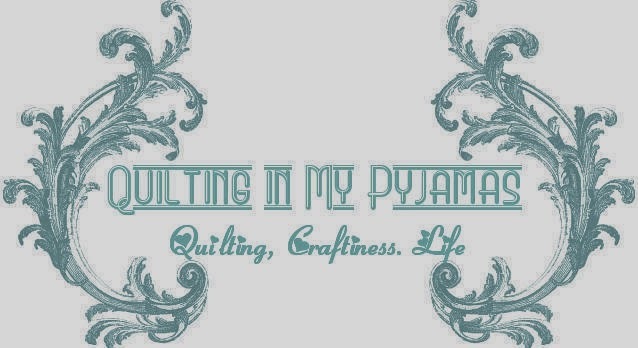 You've done a beautiful job for someone who hates free motion quilting! It only gets more fun from here on!! Yay, you did it! You should be super proud - especially as it was all without alcohol, incredible! Your meandering looks really good, too. I'm looking forward to seeing the whole thing when you're done. Thanks for giving me the idea that there may be hope for me and FMQ yet! Wa-hoo! You did it, and it looks GREAT! Sorry about the finger and glove sewing. I hope you have recovered and it doesn't hurt too bad today. Wow! You did it and it looks great. Congratulations! Looks like success! Love all that texture you've quilted in. Hope your finger isn't too sore. You've done a fantastic job Shay. Ooh, ouch! So glad you conquered your aversion to FMQ, the quilt looks fab. What's BSR? Wow! Fabulous job! I had no idea it was your first go. I am in awe!!!! I am still terrified and have a janome! Well done Shay, it's looking good. I'm no expert but I do find that the only way to improve is practice. Getting time to do that is the problem! I new you could do it! Sneak peaks are cool. Cannot wait to see the entire quilt. Sorry I've been head down bum up last couple days to finish 2 projects. I could never master the bsr on my Bernina as I am a foot to the floor type of girl. Great effort though. My progress is project 2 is finished just have to do photos shoot tomorrow. Project 3 is half quilted and need to write the pattern then Xmas in July is done and dusted and I have 2 weeks to write class notes and that course I have to do for work. You did a marvelous job, and not just for a first experience. I love that you left the blades puffy and quilted down the background. Love the quilt! I have an idea for the next "half a world around quilt along" if you are willing. See? You got this girl! Looks so great! Meant to comment yesterday! This is amazing. As always, your work is beautiful! Hope you're keeping it all to yourself. Your quilting looks great! I can't wait to see the whole quilt. Now keep at it, it only gets easier. Remember, practice makes progress. How the 'f' do you sew over your finger?! Hope it's all better now, and a good dose of alcohol helped!